For once i will post a wish list item but i need your help to make it a reality. The idea is fairly simple, a Grading Wizard, which asks questions about the comic in your hands and based on the answers provided suggest what the proper condition should be. So what i need from all of you is to determine, what those questions are, what the possible answers to those questions are, and what grade is assigned based on the answer. one thing i am not looking for this to do is mass grading, just one issue at a time. Great idea! I have to go interview Troy but I'll come back to this with my Overstreet grading guide and will post suggestions. Funky idea. There's really nothing like it out there. Here's an Overstreet Grading Guide chart that could be useful for mathetmatizing the grading process. It takes some of the guess work out of it. Here's another chart that defines the terms and makes it more precise. Way I see it a book is split up into 4 parts and then each part is also subdivided. All questions you may have, will relate to one of those subdivisions. I'll start with that. I'll get to posting questions when I've had some sleep. mathetmatizing the grading process. It takes some of the guess work out of it. that defines the terms and makes it more precise. Thanks guys. But I hope you don't think I made those charts. 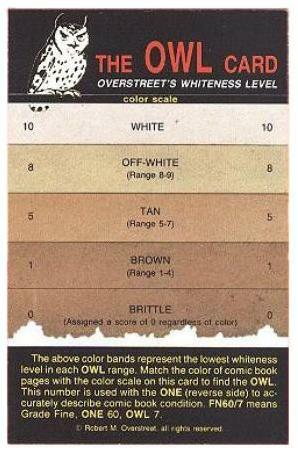 I scanned them from Overstreet Grading Guide. This project reminds me of when I designed a board game. Similar process. Breaking down the whole into it's most basic components. OK, here are some questions I can formulate based on Overstreet's Grading guide. This is a brainstorm, take it with a grain of salt. Does the book present well? No / Yes - moderately well, very well, superbly well. Does the book have good eye appeal? No / Yes - fair eye appeal, moderate eye appeal, good eye appeal, great eye appeal. Does the book appear to have been read? Never / once or twice but handled with great care / A few times and handled moderately well / Several times and not handled with care. Does the book have printing or bindery defects? Only the slightest nearly imperceptible / 1-2 defects / 2-4 defects / 3-5 defects / 6-8 defects / 1 severe defects / many severe defects. Is the front cover flat with no surface wear? Yes / No it has minimal surface wear / No it has moderate surface wear / No it has severe surface wear. Are there color flecks present? No / yes - slight, noticeable, moderate, severe. Is the cover spread well centered and firmly secured to the interior pages? Yes / No it is slightly detached and off center / No it is moderately detached and off center / No it is severely detached and off center / No the cover is detached. Are the cover corners cut square and sharp? Yes / No the corners are slightly miscut, abraded, blunted/ No the corners are moderately miscut, abraded, blunted / No the corners are severely miscut, abraded, blunted. Are there corner pieces missing from the cover? No / Yes (I think this question should be if they click yes, they are then asked how many and then asked to to describe each one with the following criteria) / a 16th inch piece is missing / an 8th inch piece is missing / a quarter inch piece is missing / a half inch piece is missing / a three quarter inch piece is missing / a one inch piece is missing / a piece more than one inch is missing. Is edge chipping present? No / yes - slight, noticeable, moderate, severe. Is there overhang? No / Yes - slight, noticeable, moderate, severe. Is edge wear present? No / Yes - slight, noticeable, moderate, severe. Are there creases on the front or back cover? No / Yes (and if yes how many and if they answer a lot of creases there's no need for them to describe each one but if they answer 2 or 3 it could be useful to describe each in measurements) Also, they should be answer if the creases break color, if they don't break color it affects the grade differently. Are there any date stamps or other types of markings on the cover? No / Yes very slight marking(s) appear on the cover / Yes noticeable marking(s) appear on the cover / Yes moderate marking (s) appear on the cover / Yes defacing marking(s) appear on the cover. Is there soiling, staining or other discoloration (such as foxing, nrowning or dust shadows) on the cover? No / Yes - slight, noticeable, moderate, severe. Is there tape or tape residue present on the exterior or interior covers? No / Yes - slight, noticeable, moderate, severe. Is there moisture or water damage present? No / Yes - slight, noticeable, moderate, severe. Is the spine tight and flat? Yes / no it is slightly loose / no it is noticeably loose / no it is moderately loose / no it is severely loose. Is there spine roll present? No / Yes - slight, noticeable, moderate, severe. Is there spine stress? No / Yes - slight, noticeable, moderate, severe. Is the spine split open in some areas? No / Yes and then number of splits and then measurement of split. Are both staples present on the spine? Yes / No one is missing / No both are missing. Do the staples appear to be the original ones? Yes / no - if the staples were replaced, were the replaced by authentic ones. Are the staples clean and without rust? Yes / no - slight discoloration appears, noticeable, moderate discoloration, severe discoloration / No - Rust appears - slightly, noticeably, moderately, severely. If rusty staples -> has the rust migrated into the paper? Yes/No. Are there staple creases? No / Yes - slight, noticeable, moderate, severe. Are there staple tears? No / Yes - slight, noticeable, moderate, severe. Is the centerfold firmly secure? Yes / No - slightly, moderately, noticeably, moderately, severely not secure / The centerfold is detached. Now, the order that you ask the questions is an issue in my opinion. I think there should be initial questions before any of these. Questions which would help save time answering questions which wouldn't apply. For instance, you could ask questions which determine if the book is in one of the extreme upper or lower grade ranges. Because if a book has no cover, all the questions relating to the cover are eliminated and really, the grade is pretty much 0. Or if the book was bagged immediately upon coming off the press, there's no need to ask about page color. The book is going to be a 9.2 or better unless it has production flaws. Another thing I'd like to see, is for the some of the key words to be hotlinked to images that show examples. It seems to me that this application you're thinking of inventing would be used by anyone even folks with no idea about grading. So if you asked them if there's spine roll, they might not know what that means, so clicking spine could popup a pic of what spine roll looks like. Wouldn't be hard to put together. All of us here have lots of comics so we can easily find examples in our collection and provide pics. Also, you might want to allow for a full version as well as a quick grade. The Quick grade eliminates a lot of questions. The full goes more in-depth. Additionally, I think the app should spit out a grade range rather than a specific grade. And my two cents, I think the decimal grading (with the number from 0-10) is a lot more intuitive than the traditional grade names. this info together so quickly. this is awesome. done i can roll a quick version from it. mark it in their stash since that uses the letters. somwhere between X and Y". We'll be keeping an eye on this thread Igor. would this grade be applied and stored for stashed comics? If so, then would the CGC/PGX column be extended to CGC/PGX/SMC, including a new dropdown for the SMC-determined grade or number? A plot twist where you didn't expect it. Bumped, cause this is f**kin' awesome. FYI, There's an online site that does this. You might want to take a look at some of what they've done. I think its done well. That seems pretty cool. Here's the above link, clickable.